Judy's medium is transparent watercolors. She generally begins a piece with a light wet-into-wet sketch, which serves as an underpainting, setting up tones and movement. Then, stretched and dried, the painting takes shape via a layering of watercolor glazes and different brush strokes, dry brushing and negative painting. 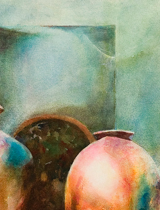 Her love for strong values and textures requires many glazes to enhance each piece. Accompanying some of her pieces is a personal writing, which serves as a road map through her thought process and inspiration. Adding yet another dimension to an already compelling style, the writings provide a link beyond the obvious visual content, allowing the viewer an emotional or spiritual journey.